During the competition road traffic is not closed in Riga and all participants have an obligation to comply with the Road Traffic Regulations during the race, to be especially careful when crossing the streets, at traffic lights. When finding a checkpoint, all the team members should check in the point - wait for the SI station signal. To be counted as a collected Check Point, all team members must check in within one minute and only first punch is counted. Be sure not to punch Check Point until you are sure that all team can punch during one minute. After cut-off time, the visited checkpoints will not be counted. For each delayed minute after cut-off time, 1 point will be removed from the points scored. If the team will delay for more than 30 minutes, no points will be counted. At the finish, team is obliged to give back the SI cards and other rented equipment to the referee. The results for teams will be displayed electronically on the screen at the competition center, also available on the website, which can be viewed from mobile phones. how to complete Rogaining run? Rogaining run is ~ 14-16km long distance – an orienteering route that is not marked and is made for individual participants, who run or walk the distance, while punching all necessary check-points on the way. 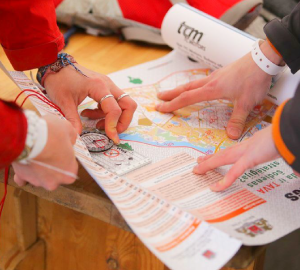 Checkpoints are indicated on rogaining map that the participants receive on the race day.